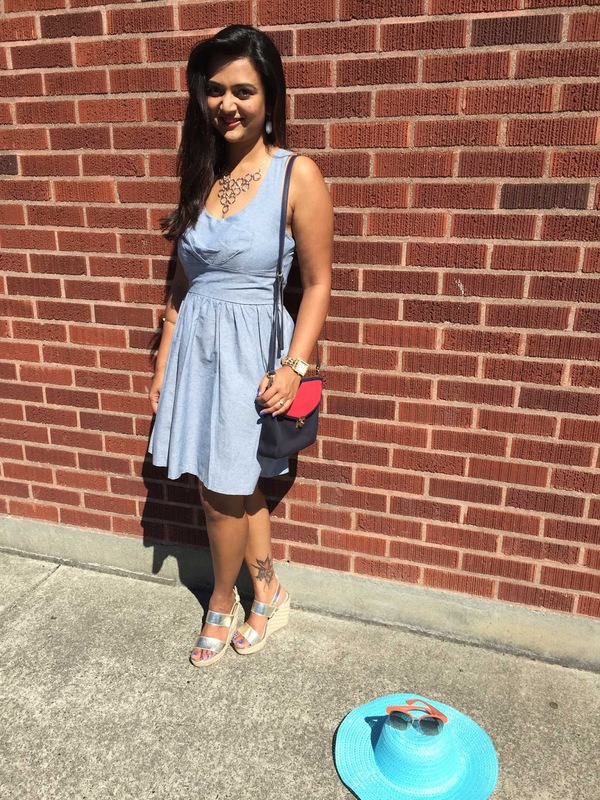 As a teenager I loved wearing Denim dresses. I am not a denim pant lover but love everything else in denims. 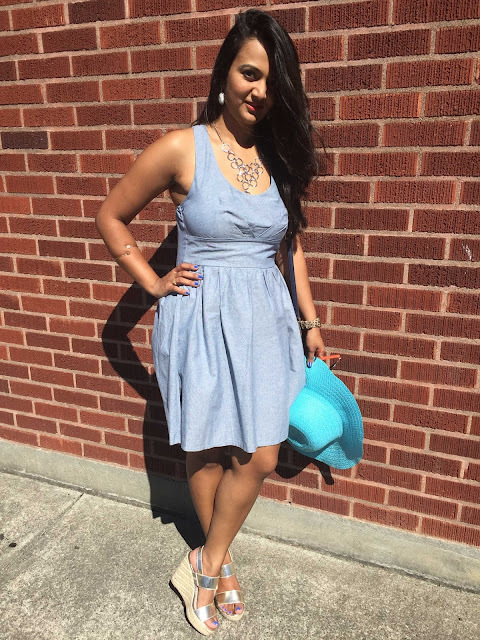 Denim dresses are available in variety of fabrics and colors. During my childhood days my mother would always dress me up in cute denim dresses. I loved wearing them then and even now. On a hot summer day wearing denim might seem like a bad choice, not if its light in weight and made of breezy fabric. 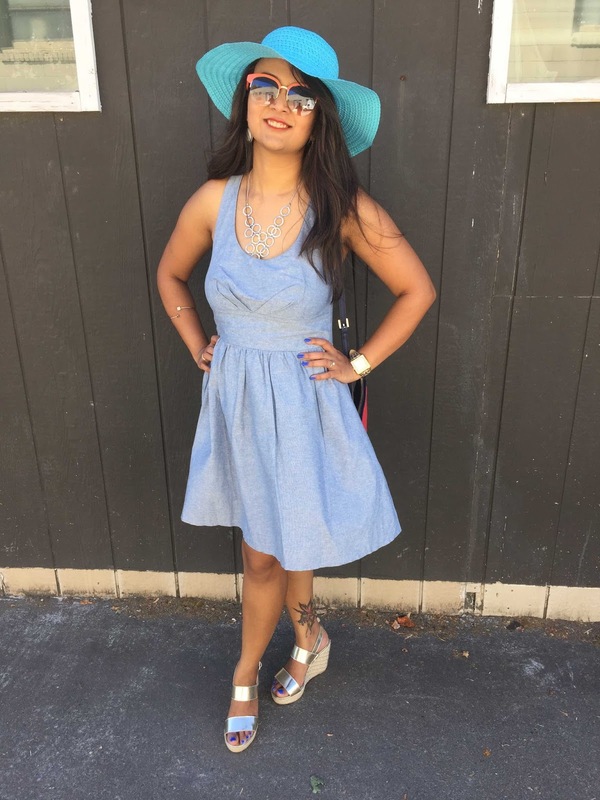 So I chose this light blue denim dress which has a flare skirt and a cute bow at the back. 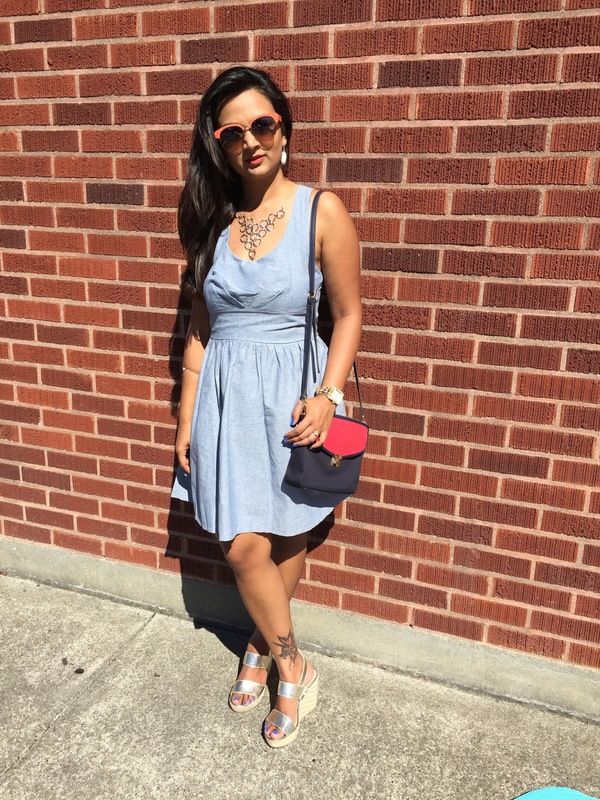 My style preference has always been comfort over trend so I like wearing a denim dress with a medium to loose fit. The denim dress itself make me feel younger that was not intentional though. 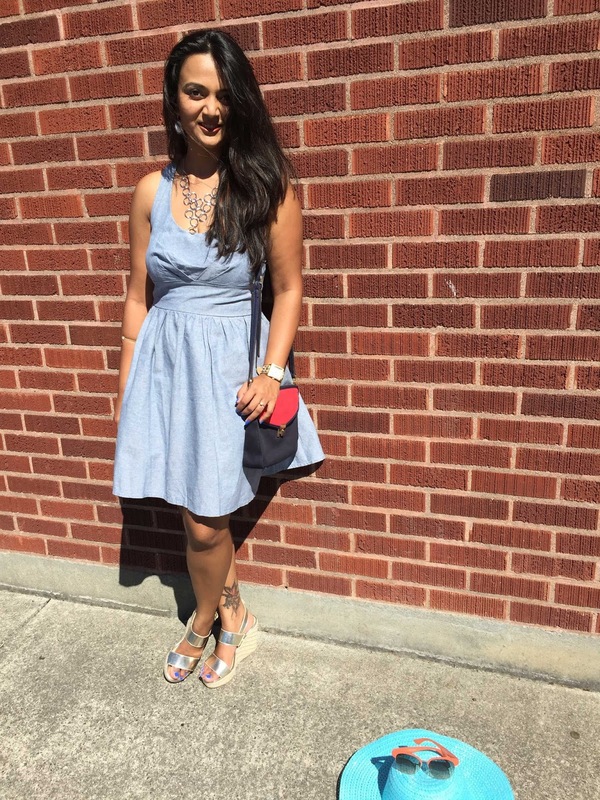 I always like to contrast my accessories so chose metallics with this denim dress. I am wearing this gorgeous layered necklace from my own label - Ananya Kreations. Do send me an email if you wish to buy it. I have mixed golden and silver metallic shades here along with white. I know Fashion police would judge me for doing that but I think it looks pretty good. What you think?? You look beautiful! Your necklace and shoes are beautifully complementing the dress. I cannot praise your very lovely dress, that stunning necklace and those amazing shoes enough! However the look is stunning without the glasses and the hat - they are somewhat jarring, The hat is too bright compared to the subdued denim.Likewise, the red of the glasses is jarring. A hat and glasses as subdued as the denim would have caused more focus on the loveliness of the dress. Likewise, a round faced watch in subdued blue, and earrings in crystal, with a smart bag of a similar design, but with grey and black or grey and dull red piping is what I'd have chosen for you. Thanks for your detailed review, appreciate it ! 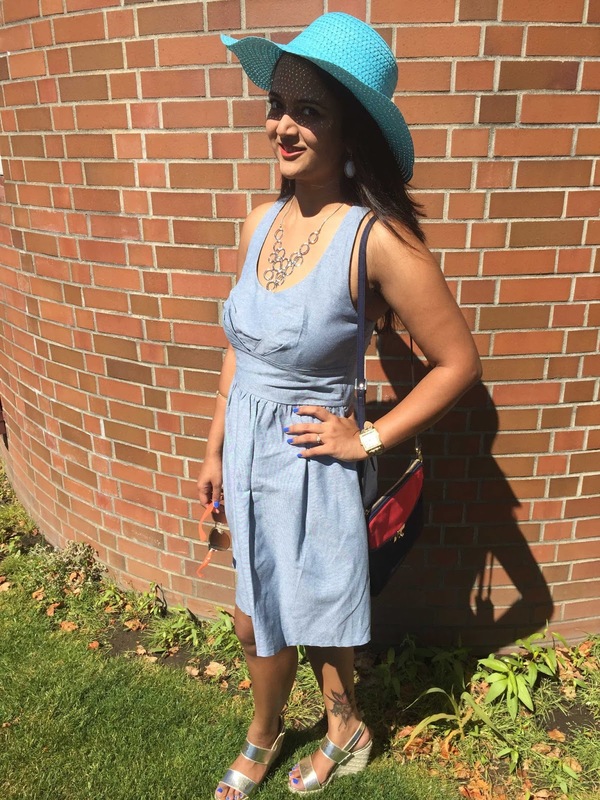 While I do agree with ur review on my jarring Hat and watch which don't compliment the outfit perfectly but I would like to say for me its more of what I like to wear and put together than following a certain style norm. Hi Ananya! Love seeing you carrying a bag and love the bag itself! And your hair. And your smile. I'm liking the cute vibe of the dress with the hat cute look super like ! I do not think they are jarring at all as per a comment earlier ! It's called a perfect contrast ! absolutely adore the colour on u. The hat is super cute and great match. Lovely styling Ananya !! 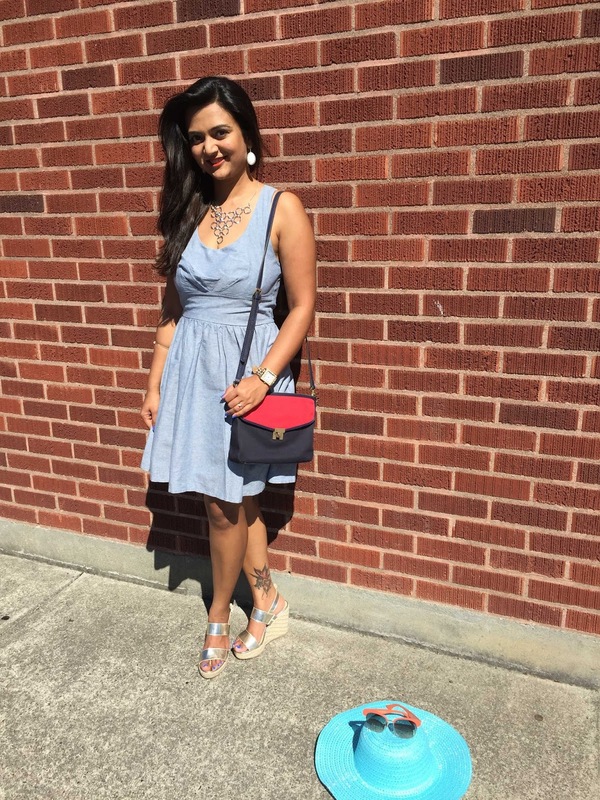 denim dress and jeans are the most popular dress for woman in worldwide.